The third year of the presidential cycle is the year after the midterm elections (i.e. November 2018). Historically, this is extremely bullish for the U.S. stock market. Here’s what the stock market does next after midterm elections. 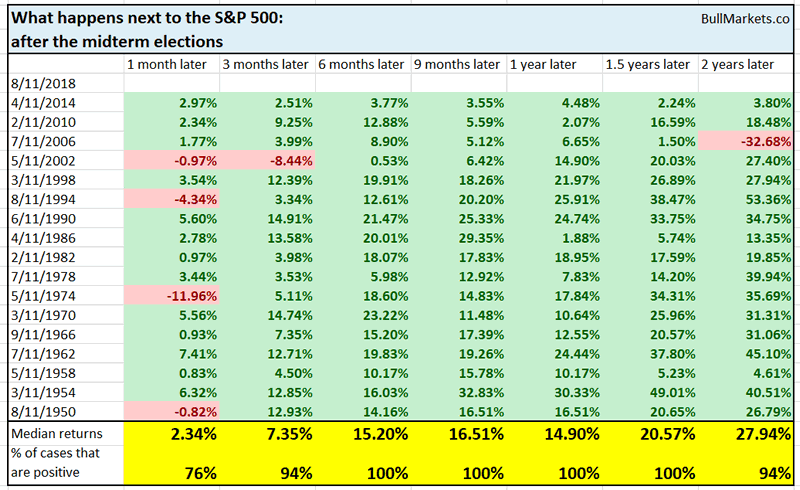 Here’s what the U.S. stock market does in the average 3rd year of the presidential cycle. As you can see, the stock market typically SOARS. Here are all the individual cases. Why is the stock market so bullish in the 3rd year of the presidential cycle, after midterm elections? There are a lot of theories. A common theory is that the president spends the first two years of his term doing tax cuts, making fiscal changes, etc to accomplish his campaign goals. These efforts then give the economy and stock market a boost in the third year. In effect, this is kind of what we are seeing right now. Trump has spent his 2nd presidential year cutting taxes, fighting trade wars, etc. Now that tax cuts have been passed and the NAFTA trade war is over, these benefits are flowing through to the economy and stock market (e.g. you can clearly see how Trump’s tax cuts have caused corporate buybacks to soar). In most cases, presidents want to accomplish the hard campaign goals during the first 2 years of his term (while his party holds a majority in Congress). Once these goals are done, their drag on the stock market is lifted in the 3rd year.